Earlier this week, I had some ground turkey to cook and didn't want my usual standby of meat sauce or Weelicious' Mexican Meatloaf. 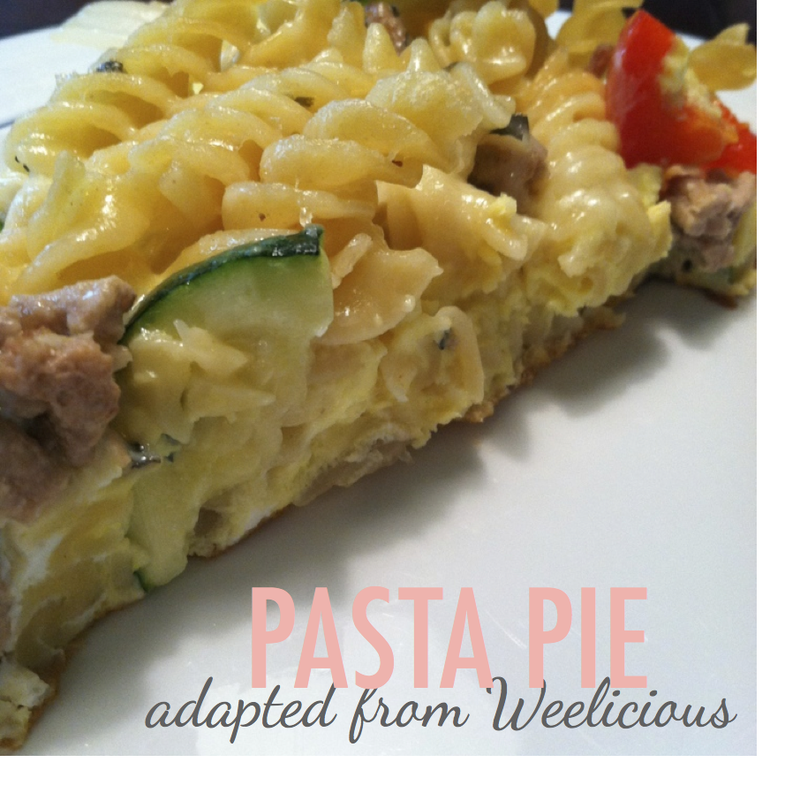 So I flipped through the Weelicious cookbook, probably the only cookbook I've ever used more than one recipe in and keep on the counter, and found Italian Pasta Pie. I adapted the recipe to fit what we had in the house, and aside from one cheat I wouldn't make the next time, it was really good! It was a different, yet familiar dish for us and considering eggs and pasta are some of Ashlynn's staples she never refuses. 2. In a large bowl, whisk the eggs, 2 tablespoons water and the salt until fluffy. Add the basil and cheese, stir to combine and set aside. 3. In a large oven-safe sauté pan, heat the oil over medium heat. Add the onion and veggies and sauté for 4 minutes, or until softened. 4. Add the garlic and sauté for 1 minute. 5. Stir in the pasta and turkey, and stir until combined. 6. Pour the eggs over the pasta mixture and sprinkle additional cheese on top. 7. Cook for 2 minutes, or until the bottom is set (do not stir). 8. Place the pan in the oven and bake for 20 minutes, or until golden on top and cooked through. 9. Slice the pie into wedges and serve. yay! so glad you posted the recipe. Rae basically lives on pasta so I'm always up for new ways to make it. Thanks girl!! Yum!! Even though we have eggs coming out of our ears with our backyard chickens, I still find it a little hard to use so many in a single recipe! Sounds great. And pasta is always my first choice! We had it a lot for breakfast while I was growing up so I was often the last one in the recess line due to my strange breakfast! !